Flowing tresses, beautiful expressive eyes…Lhasa Apso has everything a poet wants. Small but sturdy: A Lhasa Apso is a small sized dog but is quite sturdy for his size. Beautiful mane: His dense coat is straight and long. Most popular colours are gold, cream and honey, though multi-colours of brown, grey and black are also found. Devoted to pet parent: They are friendly but assertive and are affectionate towards their pet parent. They love to obey and please them. Good watchdog: Don’t go by their size as their keen sense of hearing makes them good watch dogs. Do well in apartments: They are quite active indoors and are suitable for apartments. Daily walk and play: They love to walk and play. Cocker Spaniels: a joy breed! Sensitive and demure, that’s how a Cocker Spaniel is. He is suitable as both a gundog and a pet. Hair so silky: Cockers have beautiful hair, their silky coat is flat or wavy. Suitable for all: They are awesome as family pets and also as gundogs. They are gentle with children and elders. They also do well with other pets. Good with neighbours: They will rarely bark at neighbours and disturb them. Sweet disposition: They are sweet, gentle and obedient; they are so cheerful that they are a joy to be around. Good for apartment life: They are quite active indoors and can live in an apartment, given their daily dose of exercise. 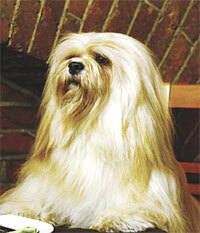 Easy maintenance: Their shining coat rules out the myth that long-haired dogs shed a lot of hair. Simply brush and comb to remove dead hair and keep their coats shining all the times. Beautiful and generous – your best friend for life! So beautiful: The shiny coat of a Golden Retriever requires regular grooming. Their hair can be cream or golden colour. Charms to kill: Lovable, charming and intelligent – that’s how a Golden Retriever is. Easy to train: Love to please, so it is easy to train them for obedience training. Love to retrieve: They love to play ball and Frisbee. Adjust to apartment life: Given adequate amount of exercise, they are happy to live in an apartment. Good watchdogs: They keep strangers at bay. Good things come in small packages…like a Pug who is small but cute, his dark, melting eyes will make you forget your worries and his happy disposition will spread happiness all around. Small but muscular: A small dog, Pugs have a charming personality…they are short, muscular and have a shiny coat. And don’t forget their characteristic wrinkled face, which adds to their cute look. Love to please: They are extremely devoted to their pet parents and love to please them at all times. Social family dog: They are extremely social and are not a one-person dog. Daily cleaning: Regular brushing is necessary to remove their shedding hair. They do need daily cleaning of their facial wrinkles and cleaning of their eyes and ears on daily basis is also a must. Take care in extreme temperatures: Since they are short-nosed, they can become over-heated quickly. Also, they cannot withstand extreme hot and cold temperatures and so should be kept in a suitable temperature at all times. Exercise for fun and health: They love to play and sensible exercise routine is a must to keep them healthy, fit and fine. The most docile, lovable and reliable natured dog – what more can you ask for? Strong n’ athletic: They are medium-sized dogs but strongly built and athletic. Weather-resistant coat: Their weather-resistant undercoat provides protection from water, cold, etc. Great family dogs: Loyal, loving, patient and affectionate – Labs go well with all family members and other pets. Easy to train: They can be easily trained and they love to please their family. But train them from puppyhood. Active dogs: An ideal pet for an active family, they love to exercise. Bathing beauties: They love to play with water and are good swimmers. If you have never loved a GSD, you have missed one of life’s greatest pleasures. Sturdy looks: A German Shepherds is an epitome of strength and royalty. Loyalty at its best: Extremely lovable and loyal to their family, they can go to any extent to protect their human pack. People’s dog: They love human company and cannot live without them but they are wary of strangers. Trainable breed: They can be easily trained and it is important to train them from puppyhood to avoid aggression and behavioural problems at later stage. Highly intelligent: They are so intelligent that they can be trained as a police dog, dog for the blind, guard dog, etc. Exercise a must: They love to be active and need to be exercised regularly.